Model Abigail O’Neill stunned women all over the world last year when she showcased her radiant good looks and impressive bikini body at age 44. 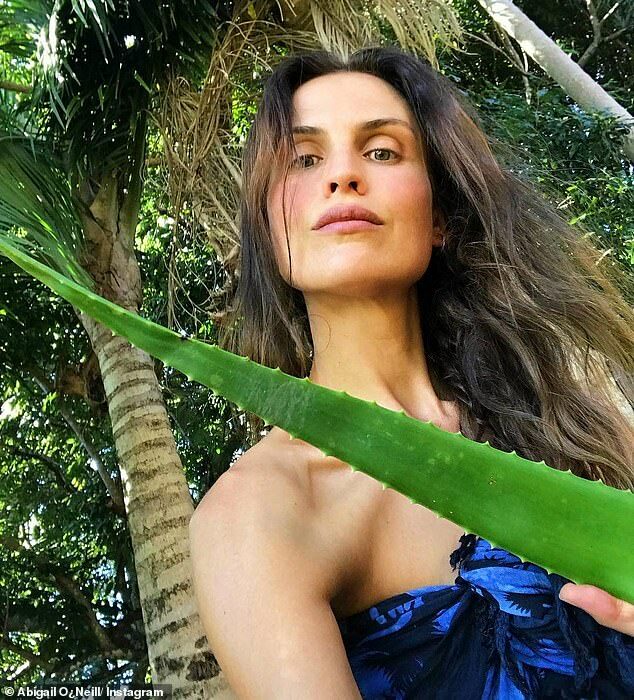 And now, the Byron Bay-based mother-of-three has revealed her very surprising beauty secrets behind her good looks – including using the plant aloe as a serum for her complexion and raw candied honey as an exfoliator. ‘This is my aloe vera from my garden,’ Abigail explained on a recent video about her skincare secrets. ‘All I do is cut it in half and you can see there is lovely slimy jelly inside. With that, I just coat the skin with all that lovely moisturising gel. Elsewhere in her beauty regime, Abigail swears by raw cacao face masks – which she said are ‘anti-aging, cleansing, balancing, nourishing and brightening’. 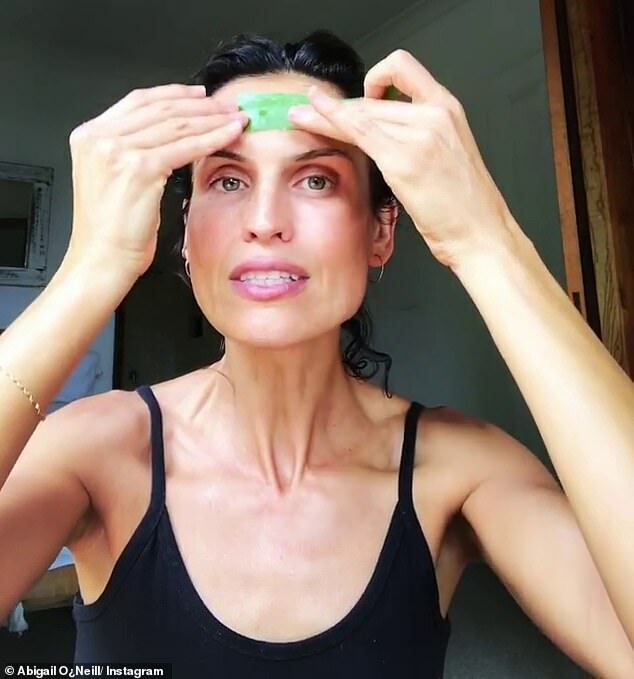 ‘Rich in antioxidants, minerals, vitamins, good fats and antibacterial properties, my raw cacao face mask is excellent for the skin,’ Abigail said. 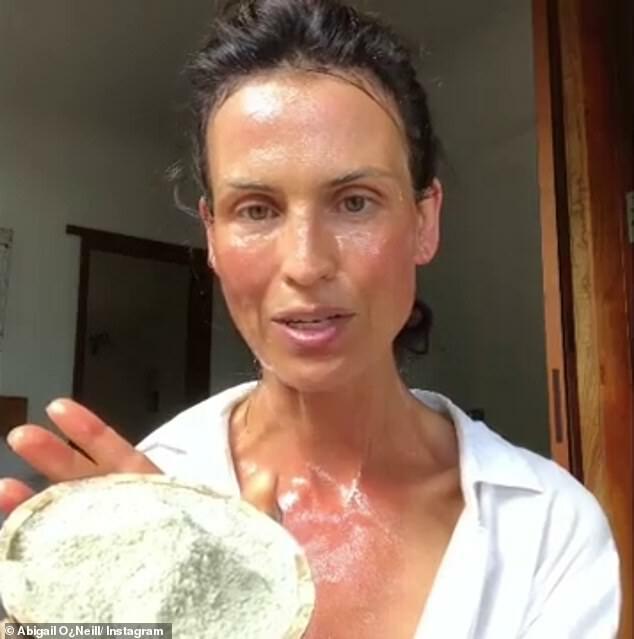 The mask contains just two ingredients – raw cacao and manuka honey, which are then mixed together, applied to the face, left on for an hour and then rinsed off. A couple of times a week, Abigail will also exfoliate with raw candied honey, which she rubs into her face, neck and the back of her hands in order to slough away dead skin. She then uses her own homemade salt scrub over her entire body, and is left with glowing radiant skin. ‘In a nutshell – clean eating, hydration, daily consumption of raw chocolate, hydrotherapy, rest, trust (letting go of stress), exercise, no alcohol or processed foods and plenty of sunshine,’ she said. ‘I also fast periodically and eat simply to give the organs a chance to rest and detoxify. If your internal organs are happy, your skin should also be radiant. She practises regular hydrotherapy – whereby she gives herself a daily blast of cold water in her baths and showers. ‘I love to swim in winter too in wild mountain streams and in the ocean as often as I can,’ Abigail added. The mother also makes sure she eats organic foods – and mostly plant-based. What’s on Abigail O’Neill’s daily plate? ‘I eat only organic, mostly raw, mostly plant based, locally grown produce,’ she said. Furthermore, she swears by raw chocolate – which she insists is the secret to her ageless complexion. ‘Raw chocolate is basically like taking a multivitamin, only much more enjoyable,’ she said. ‘Daily, I eat a generous serve of my raw chocolate,’ she said. Abigail shares elements of her 100 per cent natural lifestyle on her Instagram page.